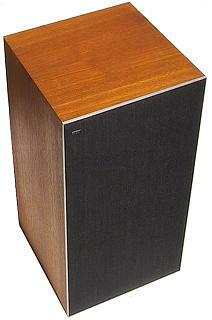 Beovox 3800 was a large, powerful loudspeaker intended for use with Beomaster 3000-2 and Beocenter 3500. It was fitted with three drivers, a 12” woofer, a cone midrange and a dome tweeter. Most unusually the woofer and midrange drivers were made by Goodmans in England (a respectable company at the time), though the tweeter came from Philips, an established supplier to B&O. To see the phrase “Made in England” cast around the rim of the woofer was indeed a surprise, though there was a reason behind it. Text copyright © Beocentral. Unauthorised reproduction prohibited. The Beovox 3800 was a “UK only” model, it was not sold in any other European markets. In these areas, the Beovox 4700/4702 was offered instead. However, when UK import taxes were added, the 4700 range became too expensive to be competitive, so it was never offered in the UK. The Design of the Beovox 3800 took advantage of a “loophole” in the tax system that allowed a really excellent product to be offered at a competitive price: any loudspeaker with a driver bigger than 12” and with a power rating greater than 50W was considered as a “professional” model, and therefore attracted no purchase tax. Fitting a 12” driver to the Beovox 3800 meant that it had a bigger woofer than the top of the range Beovox 5700, whose 10” unit was augmented by an auxiliary bass radiator. Text copyright © Beocentral. Unauthorised reproduction prohibited. The Beovox 3800 cabinets followed normal B&O practices of the period, though unusually a bracing strut was fitted between the baffle and the back, just above the woofer. This helped to make the cabinet more rigid, and to reduce colouration resulting from cabinet resonances. Text copyright © Beocentral. Unauthorised reproduction prohibited. The Beovox 3800 was capable of a very high standard of performance, especially when used with the Beomasters and Beocenters it was intended for. It was withdrawn when the Uniphase models were introduced, and replaced by Beovox S 60. Text copyright © Beocentral. Unauthorised reproduction prohibited.